The Golden Trout Wilderness is a federally designated wilderness area in the Sierra Nevada, in Tulare County and Inyo County, California. It is located 40 miles (64 km) east of Visalia, California within Inyo National Forest and Sequoia National Forest.It is 303,511 acres (1,228.3 km2) in size and was created by the US Congress in 1978 as part of the National Wilderness Preservation System. The wilderness is managed by the U.S. Forest Service. The wilderness is named for and protects the habitat of California's state fish, the golden trout.Elevations range from about 680 feet (210 m) to 12,900 feet (3,900 m).The wilderness area is bordered on the northeast and northwest by the high peaks of the southern Sierra Nevada Mountains. Cirque Peak is the high point at 12,894 feet (3,930 m). The Kern Plateau is a large tableland with sprawling meadows, narrow grasslands along streams, and forested ridgesand flats. 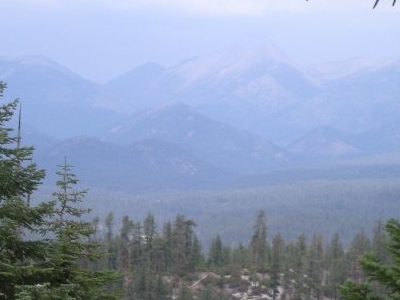 The centerpiece of the plateau is Kern Peak (11,443 ft) which has far-reaching vistas of the middle and upper Kern River drainage and much of the far southern Sierra, including Olancha Peak, the southern Kaweah Range, the mountains of the Mineral King area, and the Dome Land Wilderness of the far southern Sierra. Wildlife includes the large Monache deer herd, the sensitive Sierra Nevada Red Fox, pine martins, cougars, and black bears. 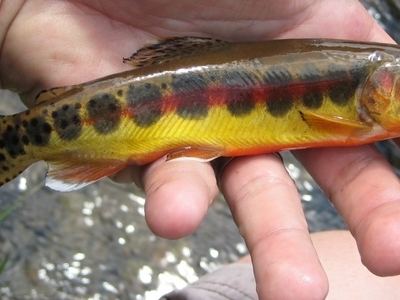 The golden trout is California's state fish and there are two distinct native subspecies protected in this wilderness. One is the South Fork Kern golden trout and the other is the Little Kern golden trout. Pure-strain Little Kern trout are restricted to isolated populations above natural fish barriers in the Little Kern drainage area and are federally listed under the Endangered Species Act. Recreational activities include backpacking, horseback riding, skinnydipping, Day hiking, fishing, hunting, rock climbing, mountaineering, skiing and snowshoeing. There are 379 miles (610 km) of trail including the Pacific Crest Trail (PCT), which stays above 10,000 feet (3,000 m) elevation for most of the 25-mile (40 km) route through the Golden Trout Wilderness. There are historical sites such as the Tunnel Meadow and Casa Vieja guard stations, and the 12-mile trail to Jordan Hot Springs along Ninemile Creek. The trail was built in 1861 by John Jordan for access to Olancha from Visalia. Past volcanic activity created the hot springs as well as Groundhog Cone and the Golden Trout Volcanic Field. Permits are required for all overnight use and there is a quota in effect for the Cottonwood Pass Trailhead. Other restrictions include a ban on wood-fueled fires along the PCT between Cottonwood Pass to the Sequoia-Kings Canyon Wilderness and also at the Rocky Basin Lake area. Here's the our members favorite photos of "Wildlife Reserves in California". 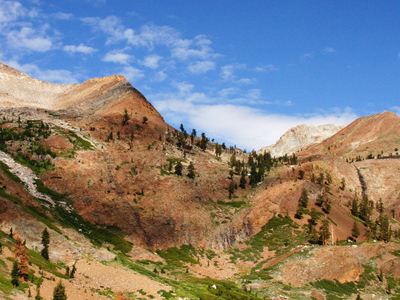 Upload your photo of Golden Trout Wilderness!